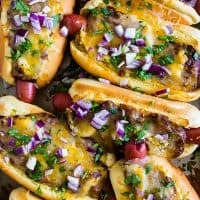 Oven Baked Chili Cheese Dogs Recipe - cooked right on a sheet pan! 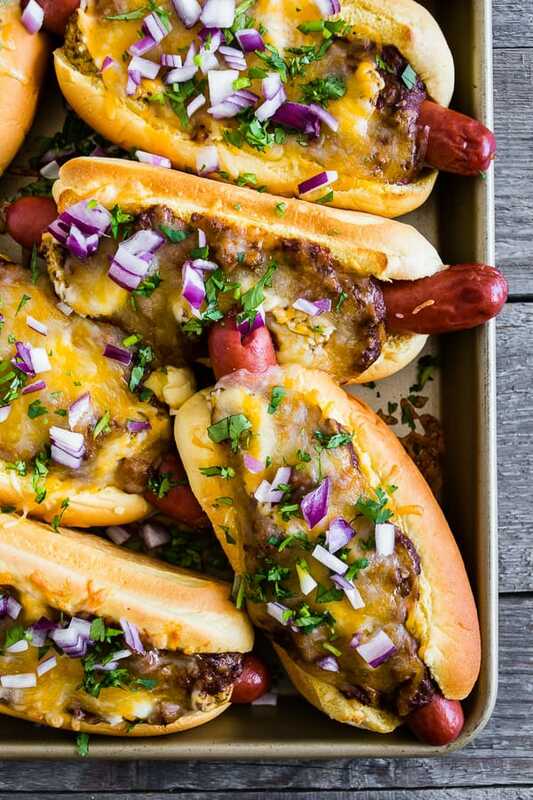 These oven baked chili cheese dogs are the perfect Super Bowl and game day treat. Made right on a sheet pan and then oven baked until hot and melty. 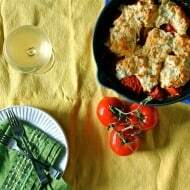 You’ll love this simple party perfect dish! I’m not sure why I’m screaming that. I mean, I love game day food I’m just not usually that into the actual game. My husband is a Patriots fan so I’ll be sure to root for them just by default. But, really I’m just into the celebrations for all. the. food. 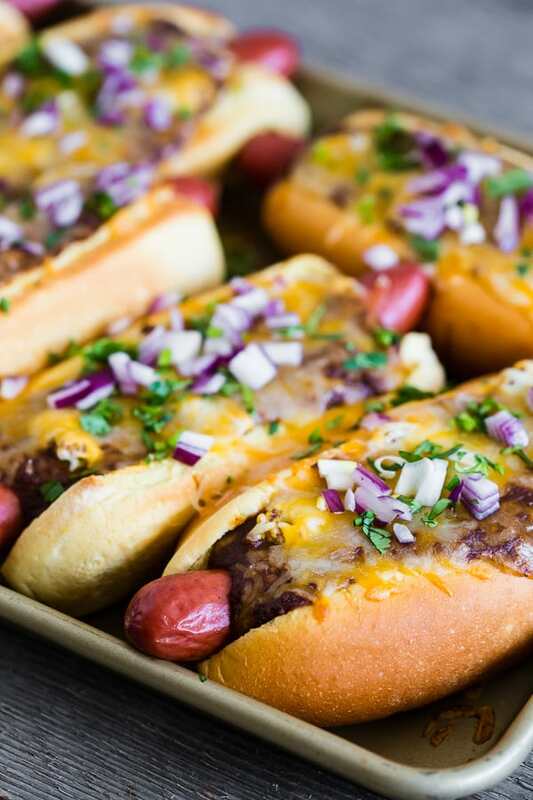 What I love about these oven baked chili cheese dogs is that they are perfect for parties (made on a sheet pan!) and taste CRAZY DELICIOUS! I used some leftover homemade chipotle ground turkey chili but honestly, canned chili works just fine. I also added a little spicy brown mustard to the hot dogs because I’m all about that spicy brown mustard life! Plus, if you make a hot dog in New York and don’t add spicy brown mustard did you even make a hot dog? Yes, you did. But people get all up in arms about their love of spicy brown mustard. Don’t tell real New Yorkers but I actually prefer yellow mustard. It’s so potent and tangy and I LOVE IT! It would be amazing on these hot dogs – just saying. Since I’m also a red onion and cilantro lover those went right on top too. I love the burst of freshness that crunchy red onion and fresh cilantro bring to hot dogs. Well, oven baked chili dogs. Not just any old hot dogs. I just want to let you know that as I’m typing this I’m having a major chili cheese dog craving. I think it’s important to pick your favorite hot dog for this recipe. Personally, I like an all-beef natural casing hot dog but you do you. Find that perfect dog and GO WITH IT! I like to cook my hotdog before I put it in the oven because I like to make sure I get super crispy skin! 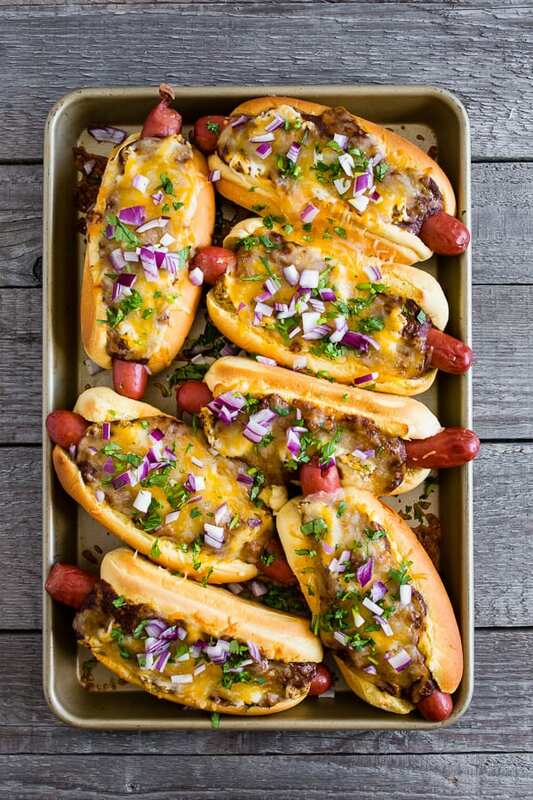 Love these oven baked chili cheese dogs? 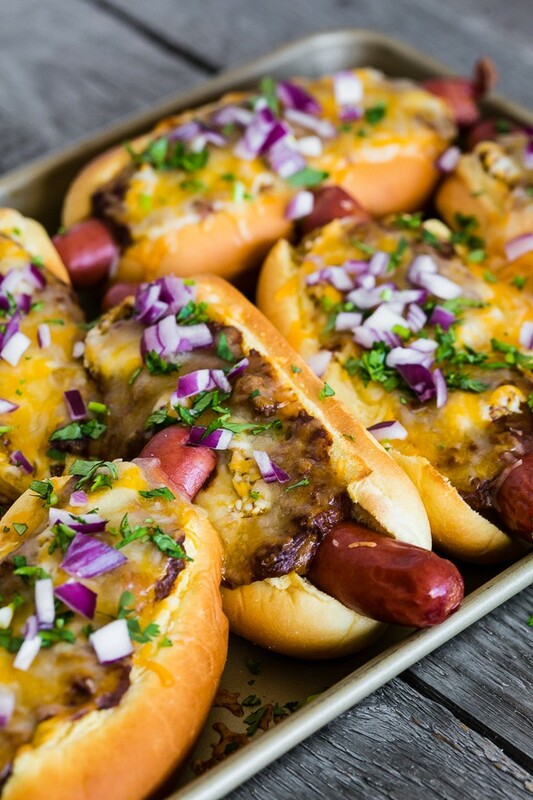 These oven baked chili cheese dogs are the perfect party meal! Made right on a sheet pan and then oven baked until hot and melty. On a non-stick baking sheet add hot dog buns and place 1 hot dog inside each bun. Spread the top of each hot dog with 1 tablespoon spicy brown mustard. Top each hot dog with 2 tablespoons chili. Sprinkle the tops of each hot dog with shredded cheddar cheese. Bake for about 10 minutes or until the cheese is melted and the chili is warmed. 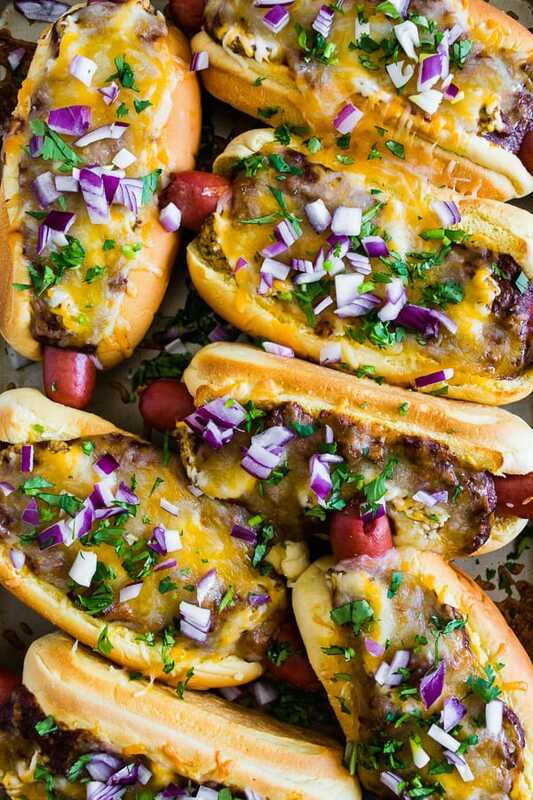 Remove from the oven and sprinkle the chili cheese dogs with red onion and cilantro. I love how melty and toasty they look! I bet baking them makes a huge difference! WOW!! These are faaantastic!!! Perfect for game day! I haven’t been able to decide what to make for the Super Bowl. 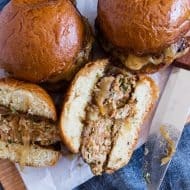 This recipe just made the decision – so tasty! These chili cheese dogs look incredible! So perfect for our weekend movie night! This looks insanely delicious! 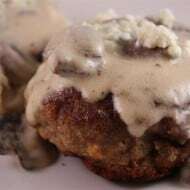 Absolutely a huge hit on the table, need to make this! Wow! these have to happen at our next party! Saving this one!